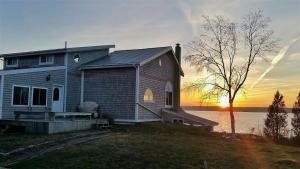 Hearts of Maine specializes in waterfront vacation rental properties along the downeast coast of eastern Maine. These cottages and homes afford our visitors beautiful views of area bays and lakes. Many people are discovering this area as one of the last great undeveloped shorelines of the lower United States. Families and couples wanting to get away from it all are attracted to our uncrowded beaches and quaint fishing villages. Our vacation properties are secluded, yet they are convenient to destinations such as Campobello, Bar Harbor and Acadia National Park. Rentals are available on a weekly basis from May through November. Some cottages are available for weekly rental during the winter. Most properties have fireplaces and are close to terrific coastal hiking trails. Over half of our properties allow pets. Linens and firewood are included, and a deposit is required. All rentals are subject to the Maine state lodging tax. Read about each individual property on this site and call or e-mail us with any questions. We are confident that you will enjoy scenic Down East Maine and the comforts of our properties. If inquiring about a specific cottage, please mention property name in e-mail. Hearts of Maine also offers Guide Service for ocean and fresh water fishing trips. Call or e-mail for details.